~~Soyuz TMA-06M launched on 23 October 2012 is a spaceflight to the International Space Station. It will transport three members of the Expedition 33 crew to the International Space Station. 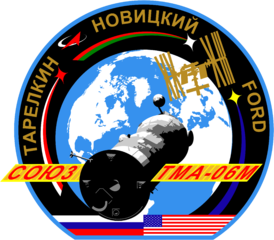 TMA-06M was the 115th flight of a Soyuz spacecraft, the first flight launching in 1967. Soyuz TMA-06M launch was also the first manned flight from the remote Site 31 pad since July 1984. The Soyuz will most likely remain on board the space station for the Expedition 33 increment to serve as an emergency escape vehicle. The three man crew comprises Commander Oleg Novitskiy, Roscosmos,Flight Engineer 1 Evgeny Tarelkin, Roscosmos and Flight Engineer 2, Kevin Ford NASA.